16/2/12 - Acquisitions - Washington, National Gallery of Art - A self-taught Afro-American artist, Robert Seldon Duncanson was famous for his landscapes of the Hudson River School, influenced by the works of Thomas Cole and which expressed notably the stages of human existence in The Voyage of Life (1842), a series which Moran probably saw. However, his still-lifes, produced in the 1840’s are less well known. 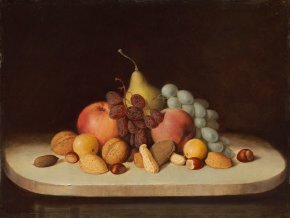 The National Gallery of Art in Washington does not own any landscapes by the painter but has recently acquired, December 2011, a pyramid of pears, apples, grapes, walnuts, hazelnuts and peanuts carefully placed on a table (ill. 1). The painting came up for auction in 2000 at Phillips de Pury & Luxembourg (today Phillips de Pury & Company) and sold for $222,500 to the Babcock Galleries in New York, where the museum then purchased it . The simplicity of the composition and the dark background enhance the texture of each piece of fruit and the interplay of colors, in the tradition of American still-lifes initiated by Charles Willson Peale and his children, Raphaelle and Rembrandt Peale. This acquisition is a welcome reminder of a forgotten aspect of the artist’s oeuvre, another example of which can be seen in the admirable bouquets of flowers at the Smithsonian American Art Museum. It joins the many still-lifes already held at the National Gallery, by Raphaelle Peale as we have seen, but also Martin Johnson Heade who loved flowers, John Frederick Peto who limited his compositions to one or two elements, as well as William Michael Harnett and his violins. 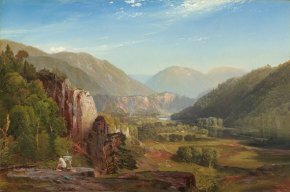 In the past few years, the American art holdings at the National Gallery have grown significantly with an addition of about ten 19th century canvases, essentially landscapes by painters of the Hudson River School. For instance, two paintings by Thomas Moran, donated successively in 2010 and 2011, correspond to distinct moments in his career. One evokes his early success with his depictions of the Rocky Mountains and the Yellowstone region. It was in part thanks to these paintings that Congress decided to create the famous National Park. During his trip in 1871 to discover the amazing natural settings with geysers, Moran stopped off in Green River, Wyoming, a town which sprang up during the construction of the railway and set down on canvas this magical vision of a red and yellow rock formation rising on the horizon (ill. 2). The artist erased any sign of industrial progress, any trace of habitation, illustrating native Indians and a world prior to the onset of industrial civilization. Ten years after his first trip out West, Moran completed this typical American landscape which now joins the museum . Another of his works reminds us that before painting the West, Thomas Moran looked East. Born in Bolton, England, he grew up in Philadelphia but returned to his home country in 1862 to study Turner’s work which he admired, continuing on to France and Italy before going back to Philadelphia. 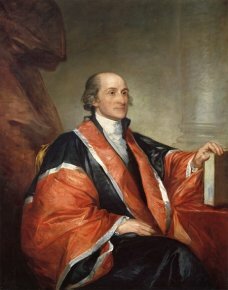 There he traveled throughout the state of Pennsylvania as far as the Juniata river, an affluent of the Susquehanna. In this green valley encircled by abrupt cliffs  (ill. 3), one sees miniscule figures, sheep, a cabin and an artist in front of his easel ; the painter places himself in the scene observing the slightest details in nature, rigorously following the precepts of John Ruskin. Even the title of the canvas, The Juniata, Evening conveys his wish to depict a landscape at a specific moment of the day. Produced perhaps for a Philadelphia banker, Frederik Tyler, the work is signed and bears the inscription “Op 8”. A year ealier, Moran had started to number and list his canvases, enabling us to know the date it was finished, its first owner and the original purchase price : $200. Martin Johnson Heade, on the other hand, preferred to depict the very special atmosphere of marshlands, far from the steep reliefs of Moran’s canvases. Donated in 2010 , one of his compositions is divided into three horizontal strips (ill. 4) : the subtle blue of the sky, the pink and gray clouds, the sunny prairie. The tree on the left provides a transition for these three, while a strangely solitary hay stack stands out on this flat plane, guiding the eye of the viewer. The artist produced about a hundred paintings representing marshes, an intermediate zone between earth and water, an ideal pretext for studying meteorological phenomena and light variations but also an invitation to contemplate. Heade belongs to the second wave of the Hudson River School which founded the Luminist current, with artists like Kensett. This painting has joined the collection alongside other works by the artist famous, as we have seen, for his flowers and birds. Also attracted by the reflections and movement of water, Alfred Thompson Bricher specialized in seascapes in the 1860’s ; A Quiet Day near Manchester (ill. 5), a canvas purchased in 2008  represents the Massuchesetts coast line north of Boston. 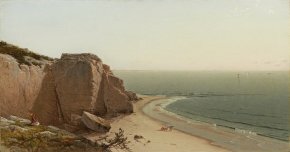 It is similar to certain works by John Frederick Kensett, notably a painting at the National Gallery, Beach at Beverly, (circa 1869/1872) : in both cases, rocks jut out towards the sea, their rough surface emphasized by a ray of sun in contrast to the peaceful expanse of ocean which fades out to meet the pale sky. Lost in the immensity, one or two miniscule figures add a touch of color to the ensemble. 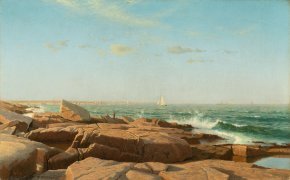 Before 2010, the museum owned two canvases by William Stanley Haseltine representing Capri (towards 1858 and 1871) but none of these “rock portraits”, precise geological views of the rocky New England coast which earned the artist’s success. This lack has now been corrected with the acquisition of Narraganset Bay  (ill. 6). Born in Philadelphia, Haseltine joined the Düsseldorf school in 1855. Before returning to the United States in 1858, he spent time in southern Italy where he studied the steep cliffs in Capri, Sorrento and Amalfi, finally devoting himself to the New England coast. This painting where we glimpse a woman and a fisherman at the far end of the rocks can be compared here also, to the works of John Frederick Kensett, John La Farge or those of Alfred Thompson Bricher. Besides the above landscapes, the National Gallery has also acquired genre paintings, in particular those of Eastman Johnson which joined the collections in 2008 (ill. 7 and 8). He also decided to leave for Düsseldorf, in 1849, then spent three years at The Hague, where he studied the Dutch masters, before settling in Paris to train in Thomas Couture’s studio. Johnson returned to live in New York in 1855 ; after undergoing the Dutch influence, he chose to treat more American subjects such as the life of Native American Indians or African-Americans in the South. 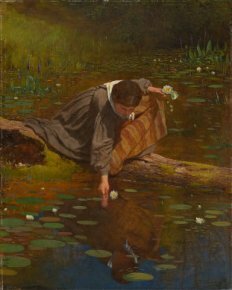 In the mid-1860’s, he developed his themes around female figures, as in this painting, Gathering Lilies, which shows a woman bending over to pick a flower in a pond. Johnson has captured the elegant grace of her movements perfectly and the tight centring imparts an intimate character to the scene. 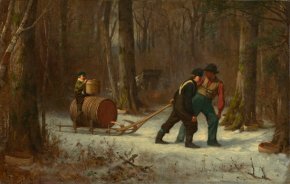 A second painting shows two boys pulling a sled laden with a barrel of sap through snow covered woods, while a third sits atop the load holding a wooden bucket in his hands. The trees around them have been bored with holes to collect the sap, in the background we can see a wooden lean-to and the red flames of a fire. William Merrit Chase was one of the great pastel artists of the 1880’s. The work which joined the National Gallery in 2007 has had many different titles ; in any case, it was known as Study of Flesh Color and Gold  (ill. 9) when it was exhibited at the Art Institute in Chicago in 1897, recalling of course some of James McNeill Whistler’s titles, much admired by Chase, such as Nocturne in Black and Gold or Arrangement in Flesh Colour and Black. 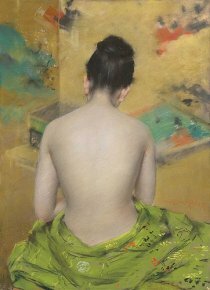 This pastel, which corresponds to the taste at the time for Japanese references, can be compared to an oil on canvas by the same artist in the Washington collections. With the help of Ann and Mark Kingon/The Kington Foundation and the Avalon Fund. Donated by the Milligan and Thomson families. Donated by Max and Heidi Berry, Ann and Mark Kington/The Kington Foundation. Donated by the John Wilmerding Collection which had purchased the painting in 1967. Purchased from Jo Ann and Julian Ganz, Jr. which owned it since 1989. Donated by Alexander and Judith Laughlin. Donated by Raymond J. and Margaret Horowitz.